The table below contains the most popular French names and names of Old French origin that have been given to baby boys in the USA during the last hundred years (1905 through 2004). The rank and count values are based on U.S. Social Security Administration counts for the one thousand most popular names given to baby boys in each of these years. This list and other similar tables on this site can help you research the history and find the meaning of many popular ethnic names for your baby boy! Actual usage of French names shown on this page may be slightly higher than the indicated usage values. 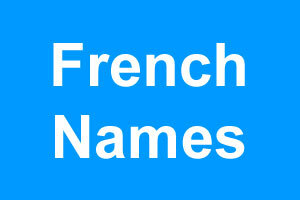 Of course these names are widely used for boys in France as well! See the Social Security card applications information for qualifiers about this data. Baby-Boy-Names.org is a Chosen Sites™ baby reference source. All information on this site is provided "as is." The publisher assumes no liability for errors or omissions. To facilitate browsing, certain links will open in new windows.